Space is a commodity in patient areas. When designing patient areas in healthcare facilities, thoughtful consideration must be made for medical equipment placement, providing ample room for staff and guests, and the placement of amenities such as the patient TV also must be well planned. Many facilities opt for wall-mounted TVs controlled by a pillow speaker, but great designs focus on a more engaging personal arm-mounted experience. 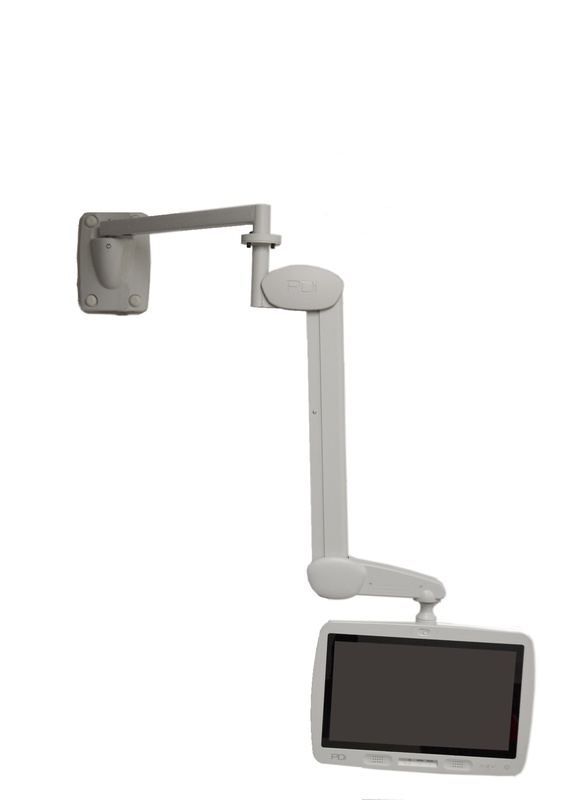 Personal arm-mounted TV-tablet displays offer convenient access to infotainment, social connectivity, telehealth conference capabilities and translation services for today's modern healthcare needs. 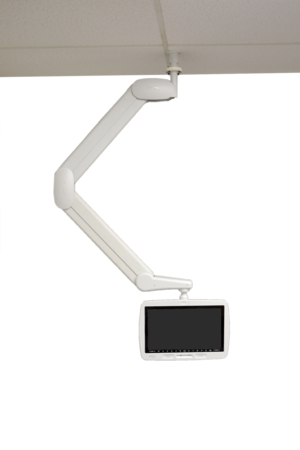 Here are 9 different ways a personal patient display device can be mounted near the patient to maximize space efficiency, patient engagement, and work well for clinical staff needs. An arm-mounted system placed at the headwall or sidewall is a popular choice, and for good reason. This setup is convenient for patients, staff and visitors alike. This mount makes it easy for the patient to maneuver the personal device to the perfect viewing position while in a bed or chair, without much if any assistance. The arm design also retracts to be flat against the wall if nurses or patients want it put away. The swing arm can rotate toward a visitor couch in the room and also provides for easy cable management. The device is typically powered with an individual power supply inside this wall mount. This allows the TV power cables to be connected in close proximity on the wall and make it very easy to adjust, unplug or upgrade cables if needed. One of the easiest arms for the patient to maneuver with little to no assistance. Cables are easy to access and manage. Retracts nicely to be flat against the wall. Easy access to the individual power supply. 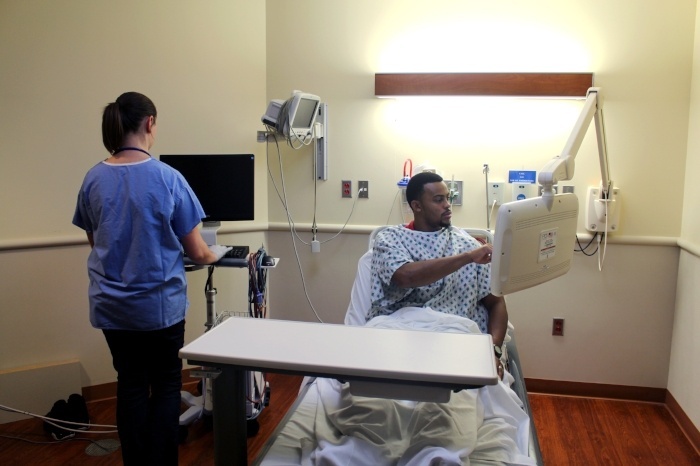 If there is a need for a lot of medical equipment on the headwall, consider the best placement for the arm-mounted TV so it is not in the way of access to medical gas or other equipment. Must pay close attention to clear space above the arm to ensure there is no interference with ceiling height, lights, or other accessories. Commonly used in multi-bed inpatient room designs. Chemo infusion and dialysis clinics. Emergency rooms, surgery centers and more. Often installed for new construction or renovations. A counter mount provides a very similar private viewing experience as the headwall mount, except it's placed on a counter. This approach can create a seamless aesthetic look and seamless design as PDi makes counter mounts in several heights to match set size, so designers can find the perfect fit without having to worry about countertop clearance. Once the arm is placed on the counter mount the arm can raise and lower based on the arms specifications. Power supply can be placed inside the cabinet to be completely hidden yet still have easy access. Avoids neck pain of patients having to hold their own consumer tablets. Arms easily extend for sitting or reclining positions. Compared to the wall mounts cable management is not as seamless, but with thoughtful execution it can be streamlined especially with A/V plate cutouts by PDi at the base of the mount. Can't place your mount on top of your counter or exactly where you need it on the wall? This is where the right angle mount solves your design dilemma. This is a versatile mount for areas that are tricky to work with. A right angle mount allows some positioning farther away from the wall in a place where the arm system wouldn't normally work, such as below a window or on the side of a counter. This is versatile mount for areas that are tricky to work with. PDi and the ProServices team can help explore applications with you. Thoughtful consideration must be given to cable management and placement of power supply when dealing with unorthodox areas. Many critical care patients are immobilized and required to lie flat on their back. The hi-tilt mount provides entertainment, information and distraction to satisfy them too. 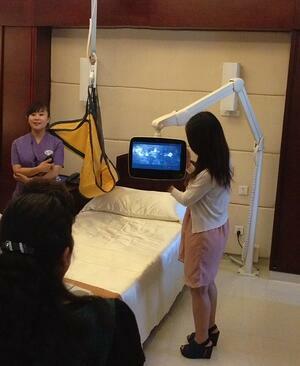 The TV can be placed directly above a patient who is limited in their movement. A central power supply is recommended for ceiling mounted arm systems so facility managers can easily access the power source from a central closet,and not place an individual power source in the ceiling above the bed. This particular ceiling mount design is made for immobile patients. Useful with renovations in older buildings having shorter ceiling heights. Also accommodates taller floor plans with up to 68" support above the ceiling. Range of motion is inhibited with this design because there is only one 39" arm section. Useful with renovation designs in older buildings having shorter ceiling heights. Great for new facilities needing long reach support above the ceiling. Another ceiling mounted option is the 48" extended reach ceiling mount that is useful for tall ceilings. This design has a large radius of motion as it has two arm sections. This design allows the whole system to be lifted high out of the way. A central power supply is recommended for ceiling mounted arm systems so facility managers can access the power source from a central closet and not place an individual power source in the ceiling. The long reach is particularly useful for elevated ceilings. Nurses and staff appreciate the way it can be fully raised to be out of the way and even walked under as they work. Patients will likely need to ask for assistance to initially lower the TV to a position where they can maneuver it. The horizontal arm system is usually specified for older building renovations where the ceiling height is restricted. 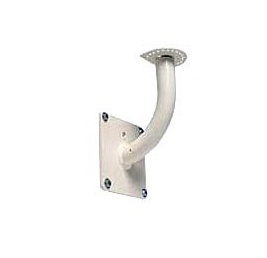 This mount offers no upward arm motion on the rigid upper arm extension. If the arm system needs to be mounted in a high place but cannot be placed on the ceiling, this is a good design option. Can be set flat against the wall and raised high at the same time. In the wrong place this arm design can feel bulky. A floor mount for a complete arm-mounted personal patient device is yet another design option. It is often chosen to mount devices in large spaces or at "patient stations" that are not along walls or have counters. 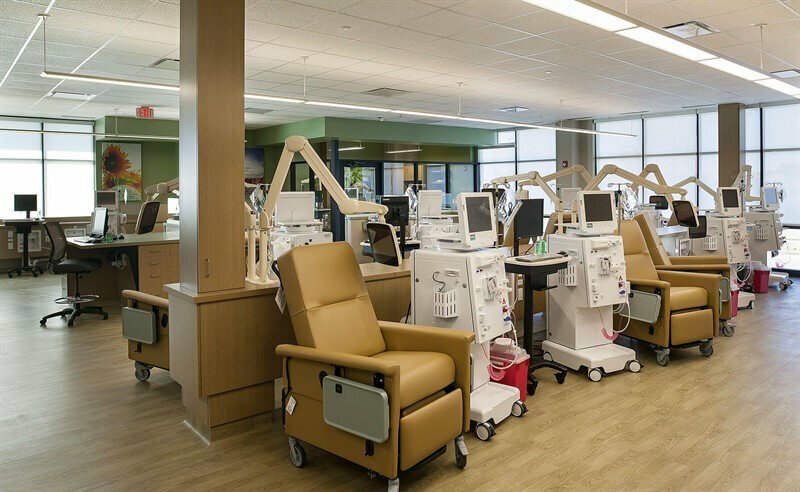 For example, larger chemo infusion or dialysis clinics may be designed having patient chairs set up in rows or squares in the center of the room. The floor mount is a heavy, sturdy, yet slim support that mounts the arm to the typical height it would be if placed on a wall mount. Rotational stops can be added to this and any PDI mounts so arms are limited in motion to not bump into walls or other equipment. Access to electrical power outlets and cable management can be tricky. Work closely with PDi and your installer. Large area dialysis and infusion clinic spaces. As technology devices become smaller and lighter it becomes easier to mount them with smaller arms in places that have less permanence than on the wall or on the ceiling. 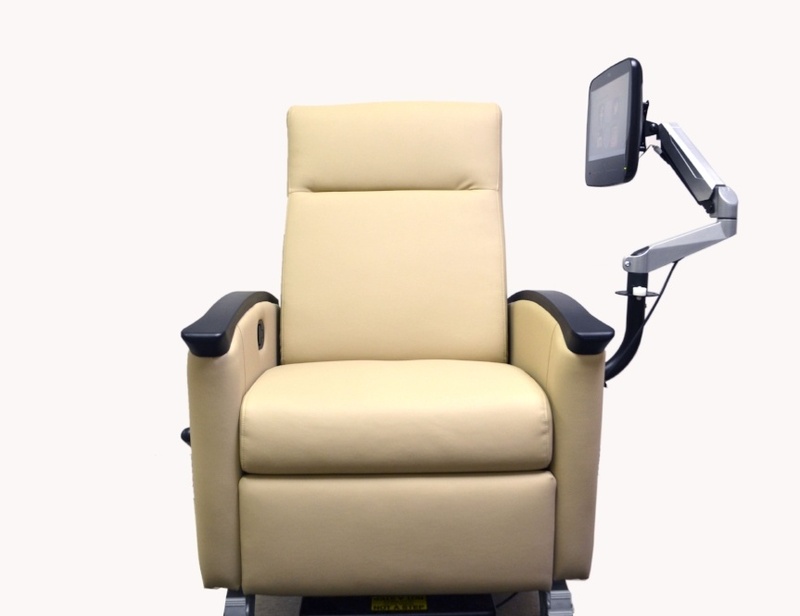 One such place is to mount a patient device on the chair itself which gives patients a real sense of ownership and feels like home comfort. Easily moved for emergencies, cleaning or room adjustments. Typically requires the chair be built with the appropriate arm mount. Ordering a chair and ordering an arm system are not particularly difficult by themselves, but ensuring they are compatible is key before ordering new products. When installed, facility staff must be mindful of the power supply cord which somewhat tethers the chair to the wall outlet receptacle. Chairs with TV mounts are not recommended to transport patients. If chair is moved frequently it may not be a good solution for your facility. Dialysis and infusion clinic spaces. Delivering entertainment, connectivity and education doesn't mean you need to take on a renovation or installation in your facility. 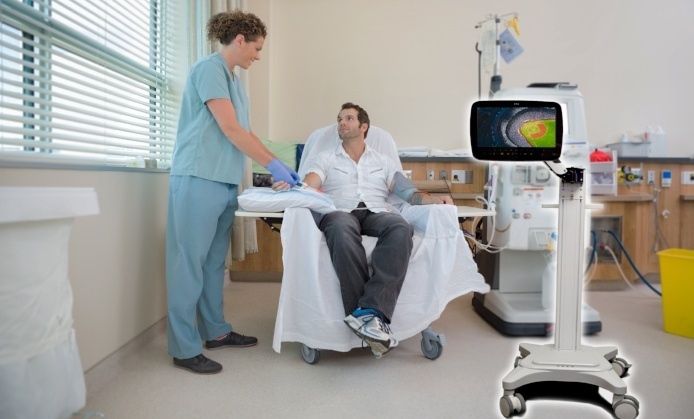 You can deliver patient entertainment with a device mounted to a mobile cart. This application is particularly useful for when a virtual translator is needed from time to time. Very Flexible. Can follow patient from room to room or even home to stay connected to the hospital as they recover. Must be mindful of power cord at the base of the cart. As you can see, there is no "one size fits all" solution when it comes to arm-mounted systems because every facility infrastructure and associated patient experience is unique. Thoughtful design considerations like these options brought to you by PDi bring the most value and patient satisfaction for every healthcare setting. Need expert advice on which application is best for you? We can help. Call PDi Proservices. We install thousands of arm-mounted systems every year. Content crafter at PDi. Writing to promote meaningful connections between patients, families and healthcare providers so that those who are healing can feel well cared for.